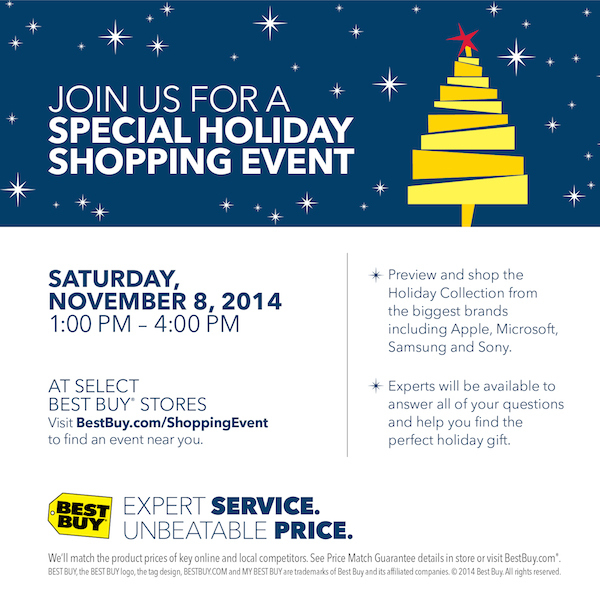 This Saturday, November 8th, is the Best Buy Holiday Shopping Event. We are excited! We shop at Best Buy often, and Best Buy’s special holiday shopping event is a big deal. We are a very techie household and between my husband, son, and myself, we are always shopping for something at Best Buy. We’re big Apple geeks, all three of us have iPhones and iPads, plus my husband works with Microsoft for work. My husband and I both have Macbook Airs, and I know he is wanting a new Apple iPad Air 2. I’m not saying he is or isn’t getting one for Christmas, just saying he wants one. Receive 3X My Best Buy points on all Samsung curved UHD TVs. Not a My Best Buy member? See a sales associate to get signed up today. As a reminder, My Best Buy members will not get 3X points if they select promotional financing (6, 12, 18 or 24 months). Save $200 when you buy a Sony XBR55X850B 4K UHD TV (SKU 5005006) with a Sony PlayStation 4. Get free Geek Squad Smart Device Online Setup (valued at $49.99) with the purchase of Geek Squad Protection for Xbox One or PlayStation 4. Get free Geek Squad Virtual Smart TV Set Up (valued at $149.99) with the purchase of Geek Squad Protection. Get 20% off Geek Squad Protection with the purchase any Geek Squad TV Installation service. Unless noted, rainchecks are available for advertised products. We reserve the right to limit quantities. No dealers. Other limitations may apply. Visit www.bestbuy.com/ShoppingEvent for more great offers, details, vendor demonstrations and to find participating stores in your area. Mark your calendars for November 8th, 2014 from 1pm – 4pm. What are looking to get at the Best Buy special holiday shopping event? I love Best Buy an I love shopping so sounds like a win win! I know I’ll be shopping there a lot for the holidays! aaahhh. I’m going to be out of town that day – dang it! I will be heading to Best Buy though later in the month to buy both the expansion for World of Warcraft and a PS Vita for our daughter for Christmas. Woohoo! Hubby and the boys are big Apple geeks. Thanks! I’ve already got plenty of Best Buy gift cards to use for the Holidays. Looking forward to shopping there for the holidays! Glad I saw this! I need to get over there tomorrow. I’m in the market for an XBox One so this is great news. I’m sure we’ll make use of that one free year! I’ve been aiming for 3X My Best Buy™ Points with Any Samsung Ultra HD Curved HDTV. Can’t wait for tomorrow. Best Buy is one of our favorite places to shop year round, but especially during the holidays.